Orlando Monteiro da Silva, was elected president of the FDI World Dental Federation by a large majority, during the General Meeting held in Singapore last 4 September. The FDI is the world’s leading, independent and authoritative dental organization. Founded in Paris in 1900, it is based in Geneva and it is comprised of almost 200 member associations from 134 countries, representing more than a million dentists from all over the world. It has official ties with the World Health Organisation and with the United Nations. 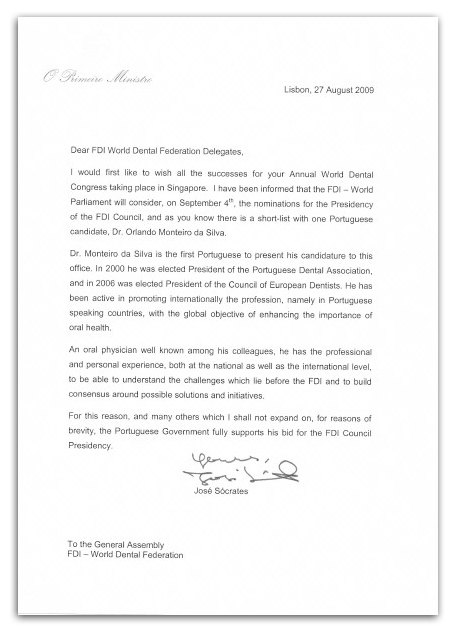 Support letter from the Portuguese Government to the candidacy of Orlando Monteiro da Silva to Presidente-Elect of FDI. You are currently browsing the Orlando Monteiro da Silva blog archives for September, 2009.